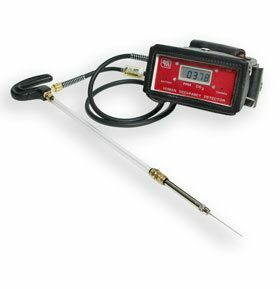 Armstrong CO2 Monitor | US Testing Equipment, Ltd. Developed by Armstrong Monitoring, the compact, rugged, and accurate AMC-CD-2 is establishing a worldwide reputation for ease of use and durability. Designed for use detecting stowaways, it is rapidly gaining popularity within the military, homeland security, and corrections communities. For any organization involved in cross border shipments, stowaways can present an increasingly dangerous and costly problem. The AMC-CD-2 offers reliable, robust, and proven technology, resulting in successful, trouble-free deployment of these highly cost-effective instruments around the world. By monitoring for elevated CO2 levels in shipping containers, a reliable indication of human occupancy is provided, allowing early detection of concealed personnel at the point of departure. The sensor uses a beam of infrared light to probe a sample of air, which is pumped through a probe assembly into the sensor. The amount of light absorbed is a function of the concentration of CO2 in the sample. The process is specific to the absorption bands of CO2, and will therefore not respond to any other gases. Numerous attachments allow samples to be taken through small apertures or rubber seals in a wide variety of containers, without compromising integrity of either the container or its cargo. The AMC-CD-2 uses state-of-the-art infrared sensing technology to provide accurate, parts per million indication in a low maintenance package. The AMC-CD-2 has been credited with saving countless lives through rescue facilitated by the rapid detection of concealed individuals. In addition to being a powerful analytical tool, it has proven itself as a strong deterrent to incidents of human concealment in locations where the technology has been deployed.